“Because students will define what’s most important for the rest of their life, we believe there’s great value in a learning experience that takes place both in and out of the classroom,” says President Dan Martin. How important do you think the university experience is in a student’s life? Van Duzer: There is a developmental phase in life where you move from being a teenager to a young man or young woman. Traditionally, the university years are that time. You begin to identify your voice and what you believe, where you’re not just parroting your parents or your teachers or your peers. A number of very important changes take place during this period. This generation of university students — often called the Millennial Generation — has been described as both civic-minded and self-centered. What have you observed about this group of students at SPU? Martin: I think that SPU students, more so than students on other campuses that I’ve been on, have a pretty large worldview, understand the complexities of addressing real-world problems, and aspire to change things. And I think there’s a confidence level in these students, both in their own ability to perform in the classroom, but also in their ability to go out and make a difference. Van Duzer: I agree. I think SPU students define success as making a difference in the world. This is generational, but I also think it’s augmented here. How does an understanding of the particular characteristics of today’s students influence SPU’s educational program? Van Duzer: It’s critical. For instance, we’re trying to pay more and more attention to learning styles, to the way students think — and it’s really quite different. We grew up learning in a kind of linear narrative. You would pick up the textbook, you would start at the beginning, and it would lead you through to an understanding of some topic. Today’s students learn by landing on a webpage, finding a link that interests them, following that link to another webpage, finding a link that interests them, and so on. That presents some real opportunities and challenges in the classroom. It’s causing faculty to do a lot of rethinking about what they do. We’re trying to move away from the language of teaching and move more toward the language of student learning. Often that means re-conceiving the role of the professor along the lines of mentor and coach. I see many examples of faculty engaging with students outside the classroom in ways that you might typically see on other campuses only with graduate students. And I think our faculty admire and respect the work that SPU staff in Student Life and Residence Life do with our students. Faculty understand that learning takes place all across campus. As the two of you have led planning for the future at SPU, you’ve described a “transformative and holistic student experience.” Why did you choose these two words to describe the student experience at SPU? Van Duzer: The word “holistic” describes the role we see ourselves playing in trying to help develop all the dimensions of a student’s life. So certainly that means academic preparation. It means Christian formation. It means character formation, because some of our students are not Christian but nonetheless appreciate our influence on character development. It means professional preparation. It means physical health and wellness. It means social development. There are certainly any number of institutions who would say, “We’re about academics.” One of the joys of being here is that we’re just as much about academics, but we’re thinking about preparing students for all of life. Martin: When we speak of “transformative,” it’s not necessarily about doing away with the old, but renewing and grounding for a greater purpose. Our goal is that students will find the individual paths that God has for them, that they will be able to answer the questions: “Why am I here?” “Why are we all here?” I hope that during their SPU experience, they will be renewed in their own heart and spirit and mind to be the people God has called them to be. I know you both enjoy spending time with and getting to know students. What have been some highlights for you as you’ve gotten to know them? Martin: In my roles, I have not had the opportunity for daily contact with students. Perhaps that is why I enjoy any connection with them that I can make, whether it is a conversation on campus, having them over to the house for dinner, or even exchanging tweets. I love to hear about a student’s dreams and vision for their future and in some way, it allows me to connect what I do with how we are educating and resourcing them to reach their life’s goals. I really want to be a resource and encourager, challenging our students and the campus to strive toward the highest levels of excellence. Van Duzer: I’ll tell you; if you walk across campus with Dan, it’s amazing. He’s been here a year and a half, and he knows everybody’s name. He’ll say, “Hey. How’s that going for you?” and it’s clear that he’s had an encounter with them and knows something about them. What do you most hope SPU students will take with them as they leave SPU and go out into the world? Van Duzer: I hope they’ll know Jesus better than when they walked in the door. I hope that relationship will propel them into the world and that they’ll look for where Christ’s kingdom is breaking in and say, “I want to be a part of that story.” I want to make sure that they leave here equipped to succeed well at the next level, not just for their sake, but for the sake of others. Martin: I’ve talked to many students who tell me they’re here at Seattle Pacific because of the University vision for engaging the culture and changing the world. 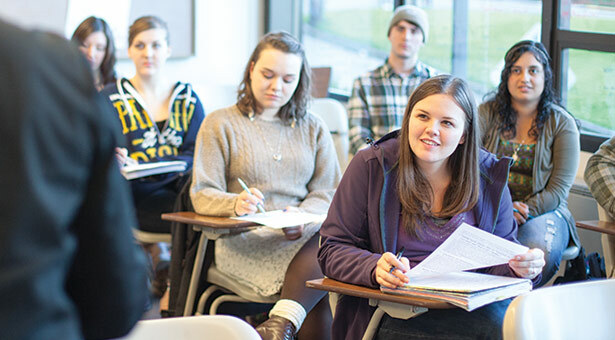 Students may find their giftedness in a specific discipline, but then part of the SPU experience is challenging them to think beyond themselves about what difference they could make in the world in that discipline. I want students to know who they are and whose they are, and to feel confident to go out into the world and thrive. I hope that they would really live and embody SPU’s mission and vision, and understand what it means to be called to live a life beyond themselves. Dan Martin is SPU’s 10th president. Learn more about him at spu.edu/president. As SPU’s provost, Jeff Van Duzer has responsibility for all aspects of the University that influence the student experience, including academics and student life. Learn more about him at spu.edu/provost.